For trade customers we can offer trade prices and a bespoke service for our linen fabric curtains. 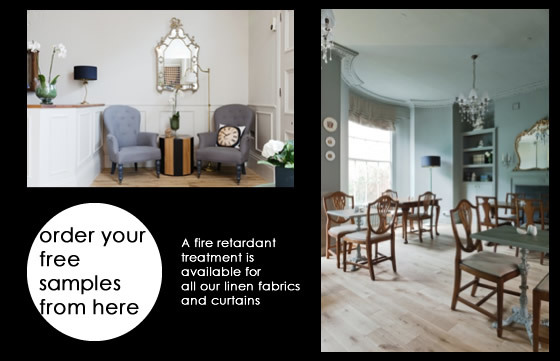 A fire retardant treatment is available for all our linen fabrics and upholstery fabrics which will be used in public spaces. For larger quantities we can source the linen curtain, linen upholstery fabric to meet each individual company’s specific needs or find alternatives for you from our extensive sample collection natural linen fabrics. Please let us know what kind of project you have and we will come up with the solutions. We have supplied curtains for the following trade customers: hotels, restaurants, interior designers, property developers, show houses etc. You can apply for a trade account and get a discount of our linen fabrics and natural fabrics.